Kundalini yoga is referred to as the yoga of awareness. Born out of the influence of ancient Indian tradition, Kundalini yoga offers an opportunity to strengthen both your body and soul through meditation, breathing and yoga postures. Most people who practice Kundalini yoga on a regular basis agree, that you cannot stay the same when you practice Kundalini Yoga. The very nature of what Kundalini yoga does is to awaken the energy of consciousness. To practice in a way, sheds light on our self-imposed limitations and invites us to develop our intuitive mind. Being able to live from our intuitive mind in the present moment is one of the main goals of a Kundalini practitioner. 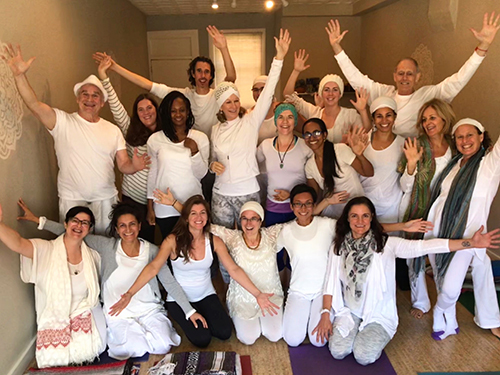 Debbie Reynolds (Gian Padmani Kaur) practices and teaches both Hatha and Kundalini Yoga at yoga retreats at different retreat locations around the world. She combines her passion for nature and travel with her love for yoga and vibrant health to share with others at these retreats. Debbie promotes a daily Hatha practice as maintenance for the body — a great way to work out kinks in my in muscles and joints, to ground and calm the mind/body. She promotes a daily Kundalini practice as a way of transformation. The kriyas and meditations are much more specific than your Hatha practice, which focuses on physical alignment. The kriyas in a Kundalini practice are a specific set of exercises that generate energy, organize that energy and deliver you to a specific energetic state — particularly one of greater awareness. Also within the practice are built-in moments of stillness where one sits quietly to awaken to our Self. The breathwork within the kriyas is so powerful that it starts to strip away the layers that veil our consciousness. The kriyas work on strengthening your nervous system, balancing your glandular system, purifying the body and calming the mind. The kriyas can be challenging both physically and mentally, but it is important to stay present and accept pleasure and pain as part of the same journey to health and balance. Our ego naturally leans towards pleasure and comfort. It takes concentrated effort and discipline to begin to release the ego’s grip on our consciousness. This effort is the work required to begin to access the truth of who we are, to create a strong connection to our Soul and therefore our purpose on this planet. It is where we start to make great strides toward living as an enlightened being. Kundalini Yoga is not to be taken lightly. It is like an express train that shakes and wakes you up out of your unconscious behavior to live an enlightened life. Experience a holistic wellness retreat with Debbie and try Kundalini Yoga for yourself. She highly recommends it as a way to stay healthy and whole in mind, body and spirt!